Summer is not over YET… Get 15% off your dog’s summer shavedown! BE AWARE that our interns are JUST LEARNING. They are ready to do simple summer shavedowns, but they are in the process of becoming groomers. They can make mistakes and the result might not look the same as if you had gotten the haircut with a finished groomer. BE PATIENT. Interns are going to take longer to finish the haircut and they might make mistakes. If you agree with these steps, then go ahead and call us to make your appointment! Want to know more about our interns? Click here to meet them! * 15% discount will be applied to your shavedown’s base price. For example, on a big dog, the base price will be $51 instead of $60. Taxes and additional charges for extra services still apply. 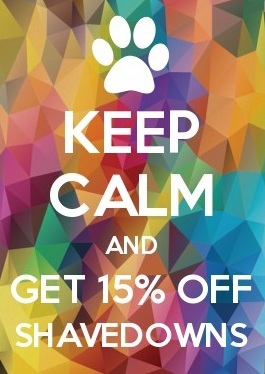 If you have multiple dogs, the 15% is applied to each dogs' base price individually! Meet our new staff members!! Holiday ALL INCLUDED Packages are here!